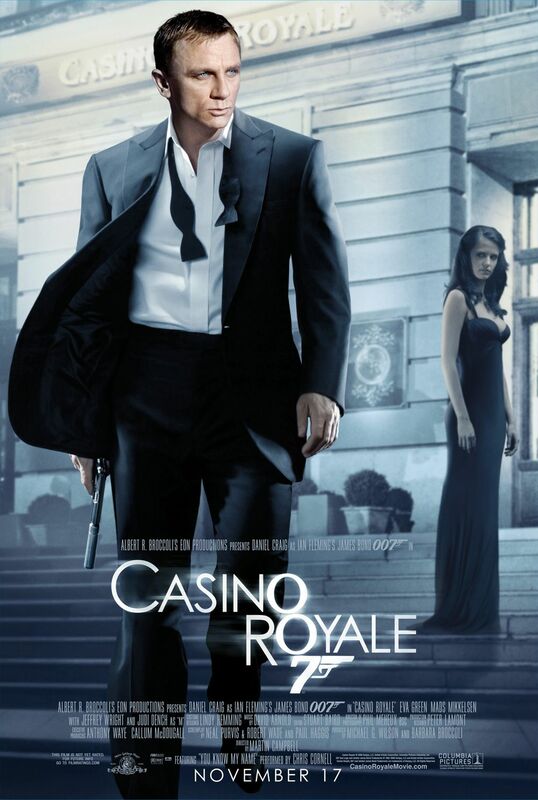 Casino Royale – Daniel Craig is James Bond. Screenplay by Neal Purvis, Robert Wade, and Paul Haggis. This is the origin story of how James Bond became James Bond. It starts out in black and white where James Bond (Craig) is confronting a section chief about selling secrets. This is a deliberate move which tells the viewer that this Bond is going to be more old school than previous movies. Le Chiffre (Mikkelsen) is running a high stakes poker game to retrieve the money he lost from an airline stock he was going to manipulate by blowing up a plane. Bond joins the poker game and brazenly confronts Le Chiffre. As the game progresses the stakes get higher both at the table and around the hotel. Vesper Lynd (Green) was sent to track the money $10,000,000 and keep an eye on Bond. Rene Mathis (Giannini) is the only point of contact at the hotel. So as they discuss there is no cavalry just Rene. At the table, is Felix Leiter (Wright) who is a CIA agent wanting to take Le Chiffre into custody. Le Chiffre is walking on a high wire of finance by double crossing people that you simply do not double cross. For him it is a matter of who will get him first the authorities or upset customers who have had their money stolen. Meanwhile, Bond learns a valuable lesson on trust that he will keep with him for the rest of his life. Martin Campbell was brought back to direct Craigs’ first Bond as he had done previously for Pierce Brosnan in Goldeneye. The success of Brosnans’ first Bond compelled the producers to try him again and the result was excellent once again. Directors’ Previous Movies: Edge of Darkness, GoldenEye, Criminal Law. If you liked this try: Any Bond, Austin Powers, Knight and Day.